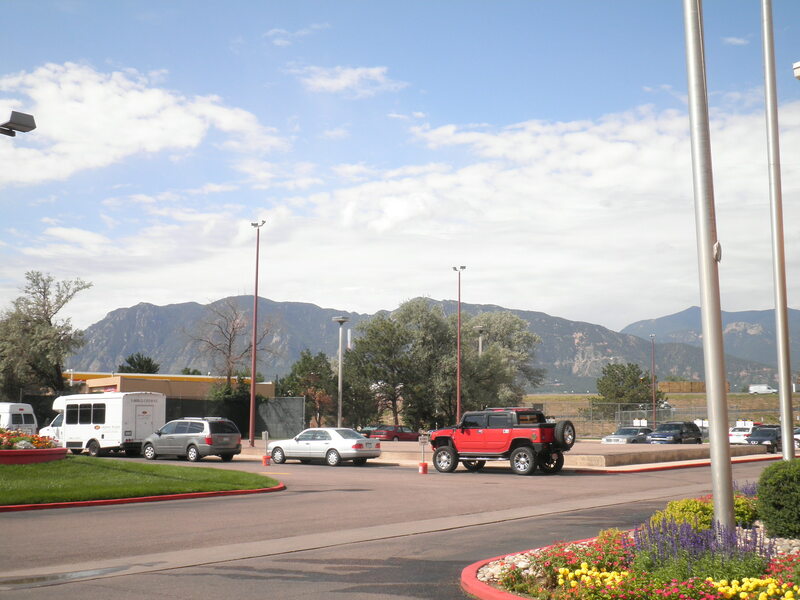 Up early on Thursday to get a start on the first full day of the Americal Division Veterans Association. We were very much looking forward to seeing all of our friends. 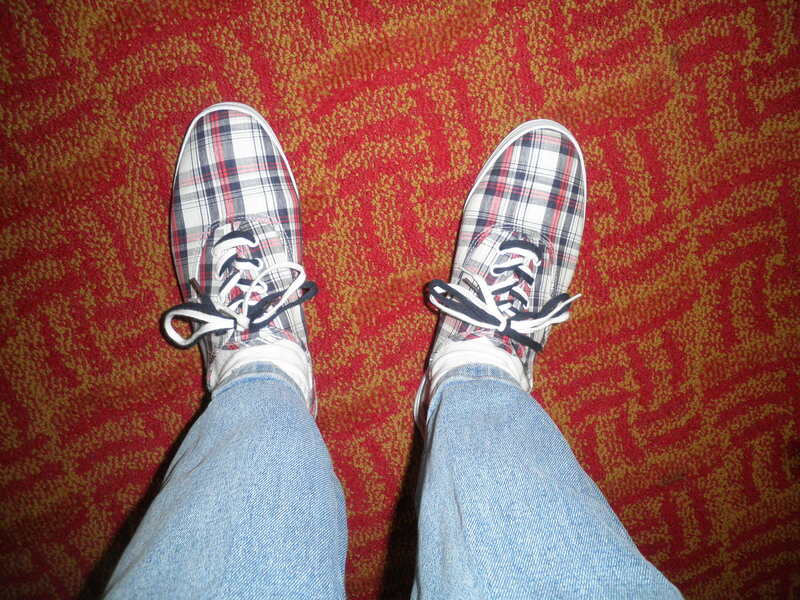 I decided that I was going to wear my new sneakers…you might remember them…$4.00!! 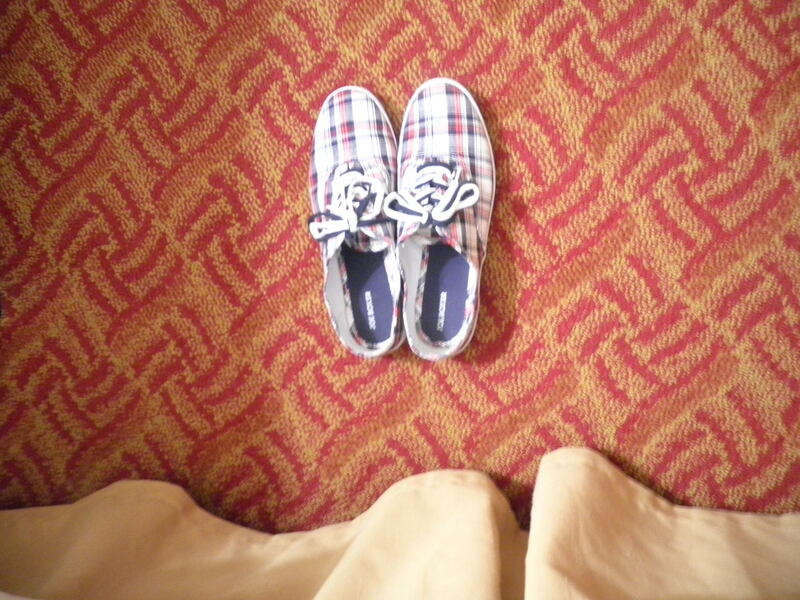 Pretty comfortable for the first time wearing them and quite festive against the carpeting in our room. We headed down to breakfast and found some of our friends getting ready to order. 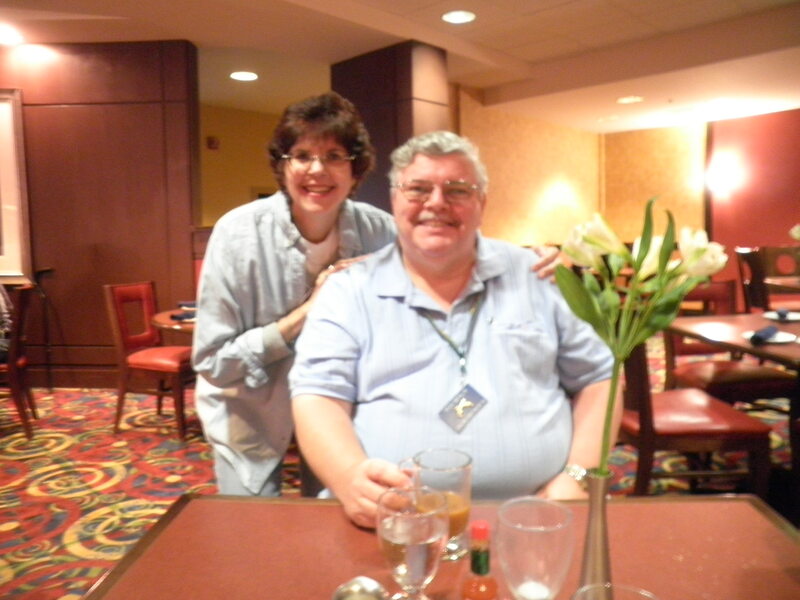 This is our friend Rich whose research found Ralph and got him involved in the organization. Breakfast was pretty amazing. It’s called a Pueblo Breakfast Bowl. Eggs, tomatoes, onions, green chiles, cheese and hash browns. It was huge and filling. Very tasty though. 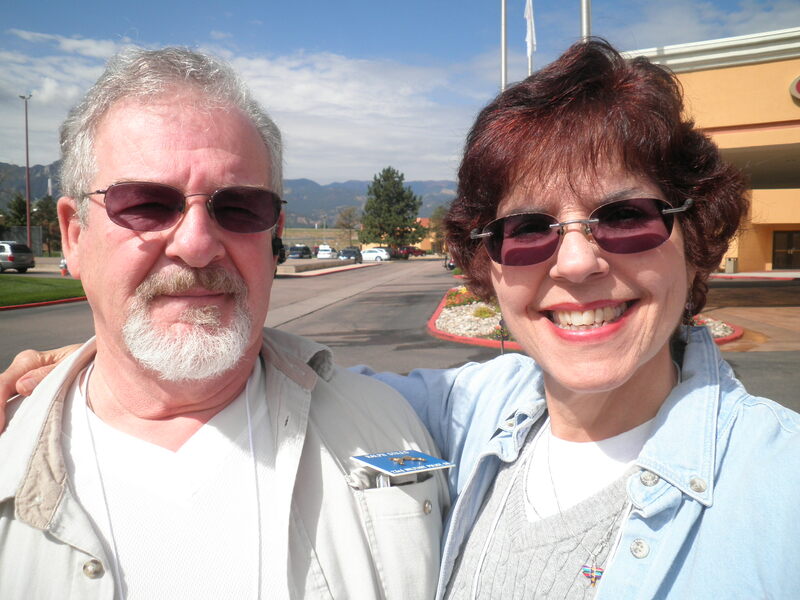 After breakfast, Ralph and I headed outside to get a look at the mountains! My sneakers are actually in this photo, you just can’t see them. The crazy lobby carpet trying to upstage my sneakers. Not happening!! Mid-afternoon, we found ourselves a little tired so we came back to the room for a rest. One of the best parts of being involved with this organization is the lady friends I’ve made. 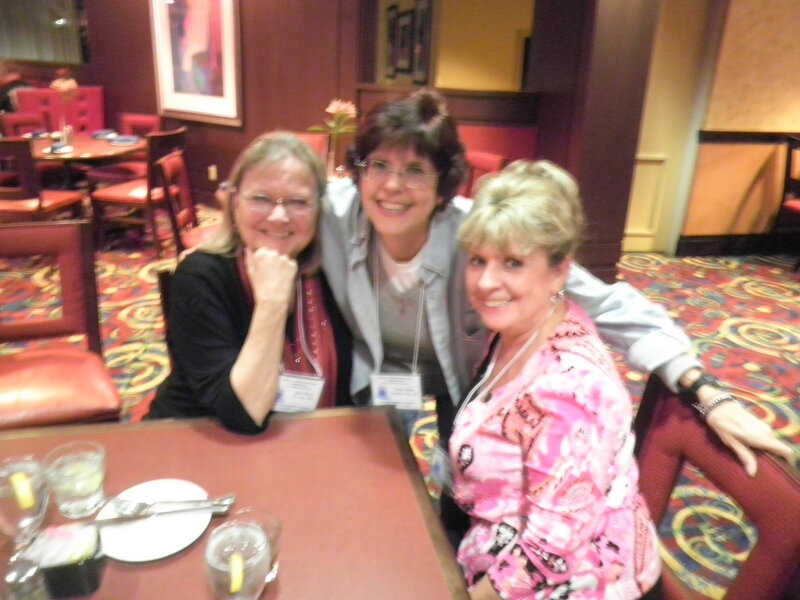 Lynne from St. Louis, Me and Darlene from Ft. Smith, Arkansas. 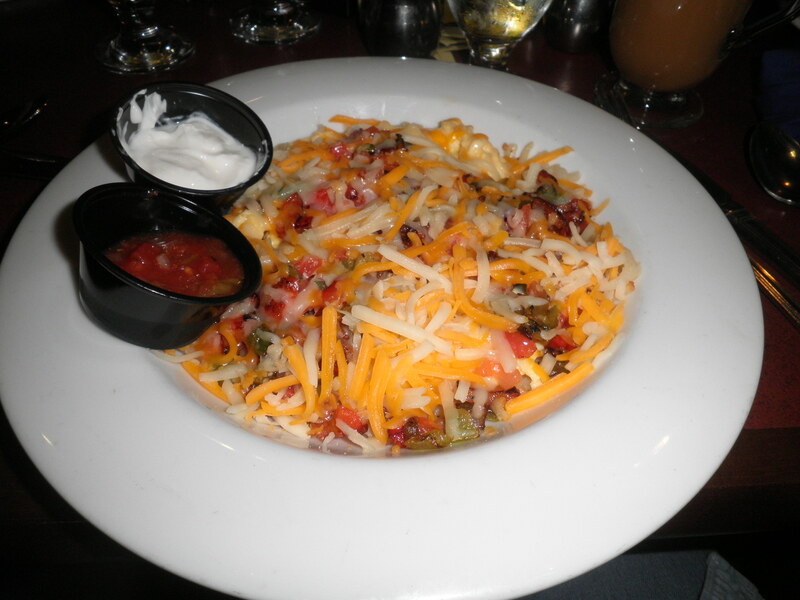 Dinner was in the hotel’s restaurant, Thibodeaux’s. First a tasty salad. 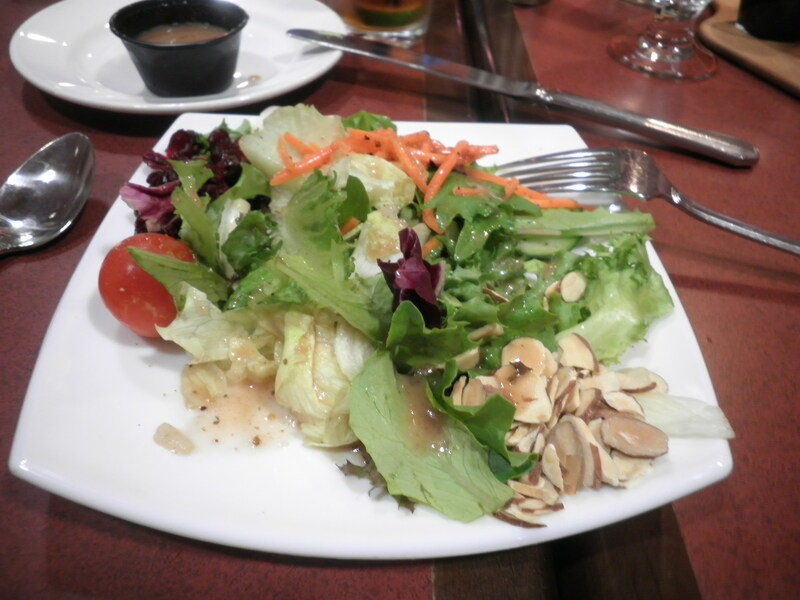 Lettuce, tomatoes, sliced almonds and dried cranberries with balsamic vinaigrette. 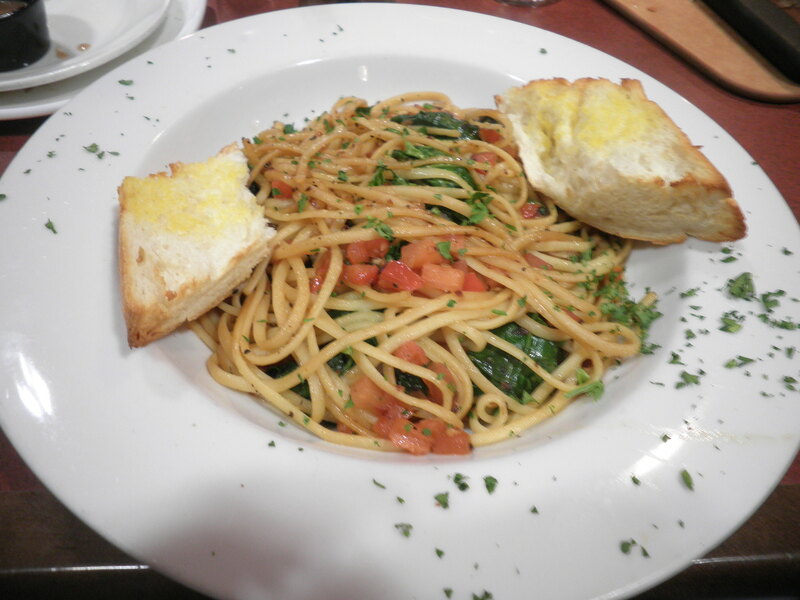 My main course was a delicious dish of linguine, tomatoes, spinach, Portobello mushrooms and shallots in a wine and olive oil sauce. It was so good! I would order it again and I may do that since we’ll be eating there again while we’re here. 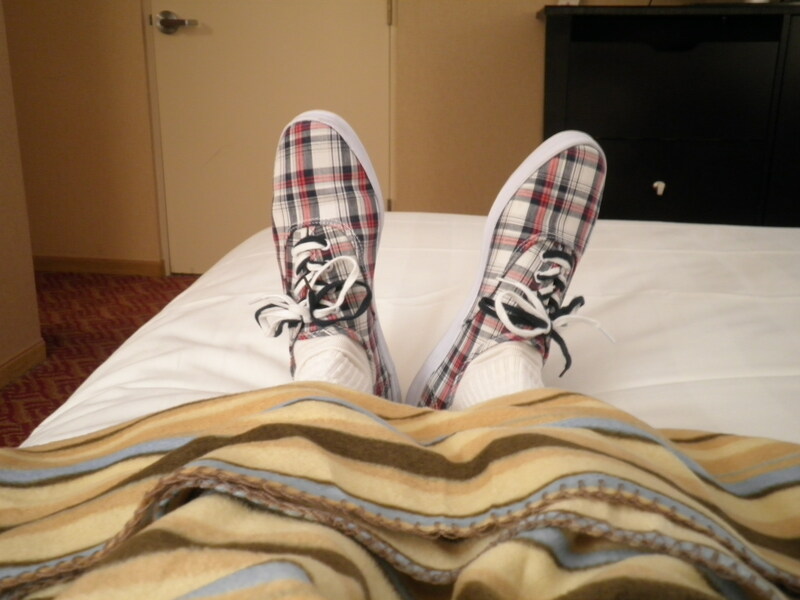 It’s pretty late now, it’s been a long day, my sneakers and I are ready to get a good night’s rest. Looking forward to another full day! 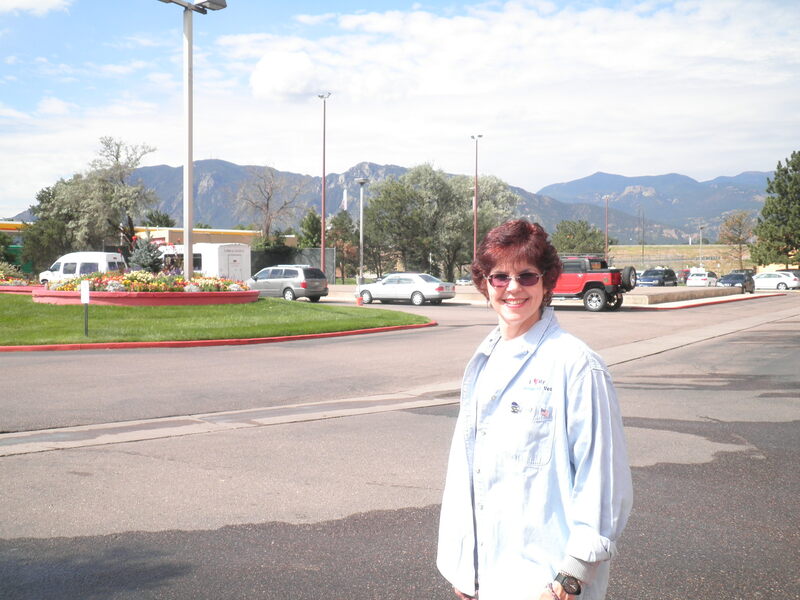 This entry was posted in Uncategorized and tagged breakfast, pasta, road trips, Sneaking Around. Bookmark the permalink. Ha! I had to giggle at the picture of you wearing your sneakers in bed! You’re too funny. And that breakfast bowl? Oh my. Please send some over to me. Steph, the breakfast was HUGE!! I love the idea and I may try to recreate it at home. Glad you like the sneaker bit. It just came to me! Fran, oh my goodness! I LOVE this post! 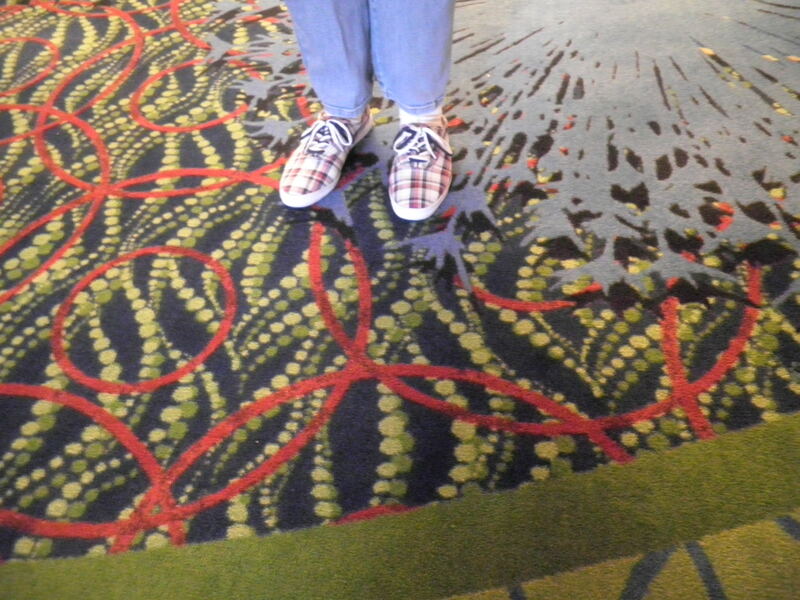 It looks like a children’t book….where do the plaid sneakers go? It looks like you guys are having a blast! And as always, gotta tell you, I love this blog! Hi Mylene! So glad you liked the post. It just came to me because of something else that happened that I’ll probably talk about tomorrow. Thanks so much for your support…great to hear from you again! Who knew that $4.00 could give someone so much happiness! The gir5ls here at work think you are INSANE!!!! Ms. Ele, the girls at work are right, I AM insane…glad they liked it though. I still owe you that $4!! Remind me to pay you!! Hugs! Thanks, Val! I’m lucky that here the food is worthy of taking pictures. I’m really lucky with the food choices! I might make the sneakers a regular feature.